U.S. astronaut Alan B. Shepard, Jr., on the deck of the aircraft carrier USS Champlain on May 5, 1961, after the return of his Mercury spacecraft Freedom 7 (in background) from the first manned suborbital flight. On April 12, 1961, humanity became a spacefaring species when cosmonaut Yuri Gagarin blasted into orbit on a 108-minute flight high above Earth. So Gagarin set the original record — first person in space. But over the past 50 years, people have notched many other records as our species has extended its toehold in the cold depths of space. Here's a look at some of these marks, from the oldest person in space to the most consecutive days spent away from terra firma. John Glenn Jr., born on July 18, 1921, in Cambridge, Ohio, is a former U.S. astronaut, Marine Corps fighter pilot, and U.S. senator. He was the third American to fly in space and the first American to orbit the Earth. On Oct. 29, 1998, he went back into space again on space shuttle Discovery's STS-95. 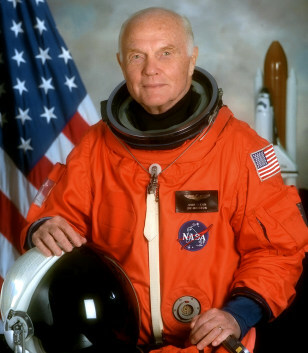 U.S. Sen. John Glenn, D-Ohio, was 77 when he flew on space shuttle Discovery's STS-95 mission in October 1998. The mission marked Glenn's second spaceflight; he had become the first American to orbit the Earth in February 1962. So Glenn holds another record as well: the longest time between trips to space (36 years). 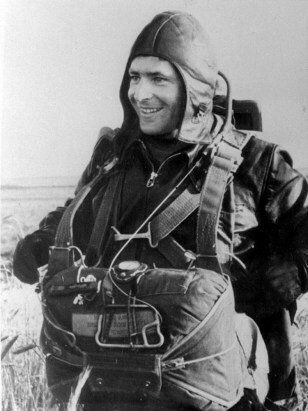 Russian cosmonaut Major Gherman Titov, shown in an undated photo, made the first space flight of more than 24 hours aboard Vostok 2, Aug. 6, 1961. Cosmonaut Gherman Titov was a month shy of his 26th birthday when he launched into orbit aboard the Soviet spacecraft Vostok 2 in August 1961. He was the second person to orbit the Earth, performing 17 loops around our planet during his 25-hour flight. Titov was also the first person to sleep in space, and reportedly the first to suffer from "space sickness" (motion sickness in space). Valery Vladimirovich Polyakov, born on April 27, 1942, in Tula, Russia, is the cosmonaut who holds the record for the longest single spaceflight in history. 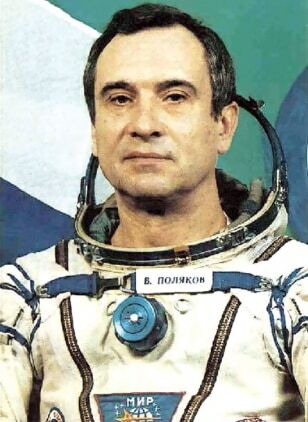 Polyakov in 1972 passed his exams to become one of the first doctor-cosmonaut trainees from Biomedical Problems in Moscow, the leading Soviet institution for space biomedicine. Russian cosmonaut Valery Polyakov spent nearly 438 consecutive days aboard the Mir space station, from January 1994 to March 1995. He therefore holds the record for longest single human spaceflight — and perhaps set another one for wobbliest legs when he finally touched down. U.S. astronaut Alan Shepard Jr. is pictured on the deck of the aircraft carrier USS Champlain on May 5, 1961, after the return of his Mercury spacecraft Freedom 7 (in background) from the first manned suborbital flight. 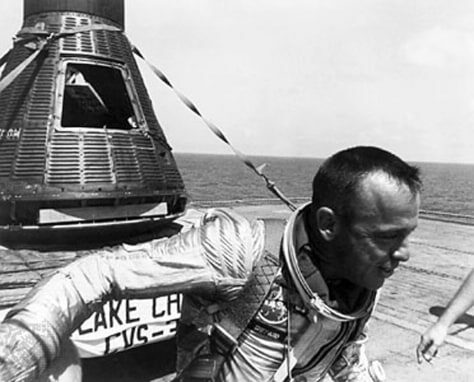 On May 5, 1961, Alan Shepard became the first American in space. He set another record on that flight, one that stands to this day: briefest human spaceflight mission. Shepard's suborbital flight in NASA's Freedom 7 vehicle lasted just 15 minutes, carrying him to an altitude of 115 miles. He splashed down in the Atlantic Ocean just 302 miles downrange of his Florida launch site. Shepard would later get more than this tiny taste of space experience. In 1971, he went to the moon on NASA's Apollo 14 mission. During that flight, the 47-year-old astronaut set another record, becoming the oldest person to walk the surface of another world. 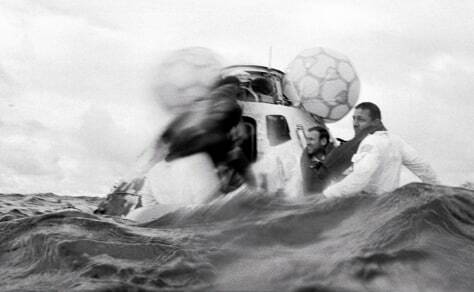 Apollo 13 astronauts tread water as they await their recovery helicopter. The record for the greatest distance from Earth has stood for more than four decades. In April 1970, the crew of NASA's Apollo 13 mission swung around the far side of the moon at an altitude of 158 miles, putting them 248,655 miles away from Earth. It's the farthest our species has ever been from our home planet. 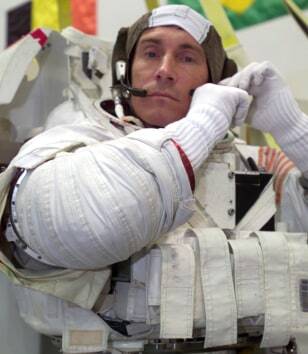 Cosmonaut Sergei K. Krikalev, Expedition 11 commander representing Russia's Federal Space Agency, dons a training version of the Extravehicular Mobility Unit space suit before being submerged in the waters of the Neutral Buoyancy Laboratory near the Johnson Space Center. Cosmonaut Sergei Krikalev holds this record, with a little more than 803 days accrued over six spaceflights. That's more than two years and two months spent zipping around the Earth at about 17,500 mph. For women, the record is held by NASA astronaut Peggy Whitson, who spent more than 376 days in space. Krikalev holds another title, this one less official: the last citizen of the Soviet Union. The cosmonaut was aboard the Mir space station when his country collapsed in December 1991. When Krikalev returned to Earth in March 1992, he came home to Russia rather than the U.S.S.R.
Backdropped by Earth's horizon and the blackness of space, the International Space Station is seen from space shuttle Discovery as the two spacecraft begin their relative separation on Sept. 8, 2009. This record belongs to the International Space Station, and it grows every day. 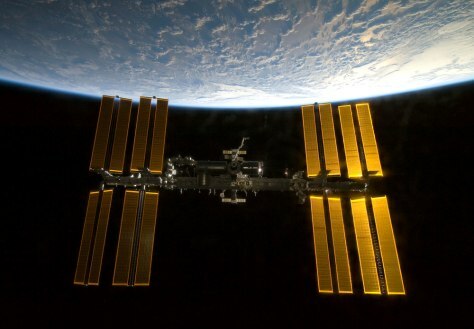 The $100 billion orbiting lab has been continuously occupied since Nov. 2, 2000. This span of time — plus two days, since the first station crew launched Oct. 31, 2000 — also marks the longest period of continuous human presence in space. The space shuttle Columbia launches on STS-80 on Nov. 19, 1996. 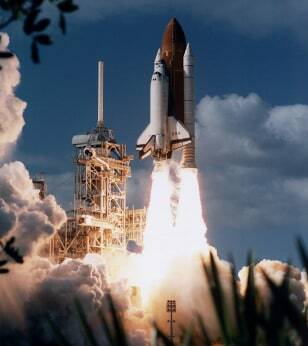 The space shuttle Columbia launched on its STS-80 mission on Nov. 19, 1996. It was originally slated to return to Earth that Dec. 5, but bad weather pushed the landing back two days. When Columbia finally came home, it had spent nearly 17 days and 16 hours in space — a record for a shuttle mission. 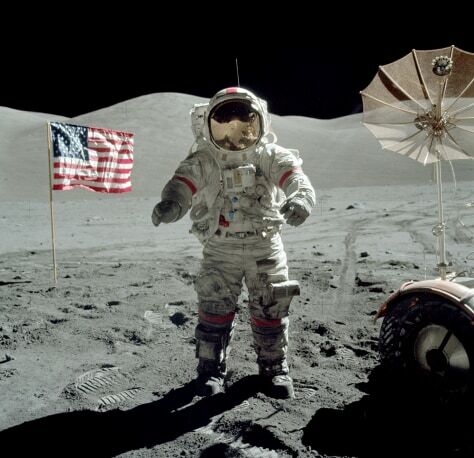 In December of 1972, Apollo 17 astronauts Eugene Cernan and Harrison Schmitt spent about 75 hours on the moon in the Taurus-Littrow valley, while colleague Ronald Evans orbited overhead. Near the beginning of their third and final excursion across the lunar surface, Schmitt took this picture of Cernan flanked by an American flag and their lunar rover's umbrella-shaped high-gain antenna. The prominent Sculptured Hills lie in the background and Schmitt's reflection can be made out in Cernan's helmet. In December 1972, Harrison Schmidt and Eugene Cernan of NASA's Apollo 17 mission spent just under 75 hours — more than three days — poking around on the surface of the moon. They also performed three moonwalks that lasted a total of more than 22 hours. Perhaps the astronauts lingered because they suspected humanity wouldn't be back for a while — Apollo 17 marked the last time people traveled to the moon, or even went beyond low-Earth orbit. 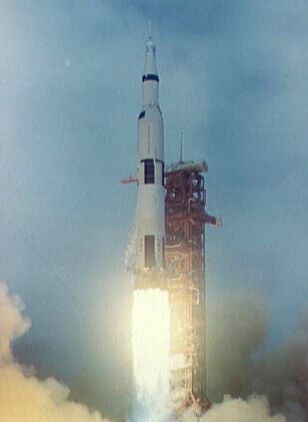 The Apollo 10 takes off on a mission in July, 1969. The spaceship reached a top speed of 24,791 mph. The crew of NASA's Apollo 10 moon mission reached a top speed of 24,791 mph relative to Earth as they rocketed back to our planet on May 26, 1969. That's the fastest any human beings have ever traveled. The Apollo 10 mission served as a dress rehearsal for NASA's first moon landing two months later, on July 20, 1969. Apollo 10 astronauts Cernan, John Young and Tom Stafford orbited the moon in their command module Charlie Brown and Lunar Module Snoopy. Later, Cernan and Young took the Snoopy lunar lander down to within 50,000 feet of the moon's surface before returning to dock with the Charlie Brown module. Franklin Chang-Dìaz, left, and Jerry Ross each flew into space seven times. This one is shared by two NASA astronauts. 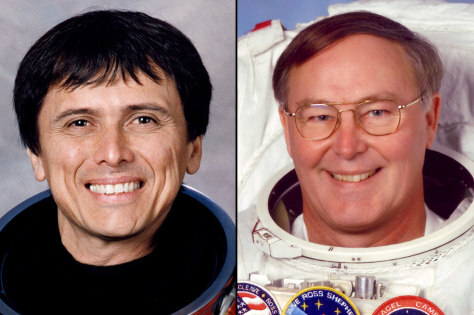 Franklin Chang-Diaz and Jerry Ross both went to space seven times aboard NASA's space shuttles. Chang-Diaz made his flights between 1986 and 2002, while Ross made his between 1985 and 2002. Anatoly Solovyev is welcomed aboard the Russian space station. Russian cosmonaut Anatoly Solovyev made 16 spacewalks over the course of five missions in the 1980s and 1990s. Solovyev spent more than 82 hours outside his spacecraft on those excursions — another record. On March 11, 2001, NASA astronauts Jim Voss and Susan Helms spent 8 hours and 56 minutes outside the space shuttle Discovery and the International Space Station during the STS-102 mission, performing maintenance work and preparing the orbiting lab for the arrival of another module. On March 11, 2001, NASA astronauts Jim Voss and Susan Helms spent 8 hours and 56 minutes outside the space shuttle Discovery and the International Space Station during the STS-102 mission, performing some maintenance work and preparing the orbiting lab for the arrival of another module. 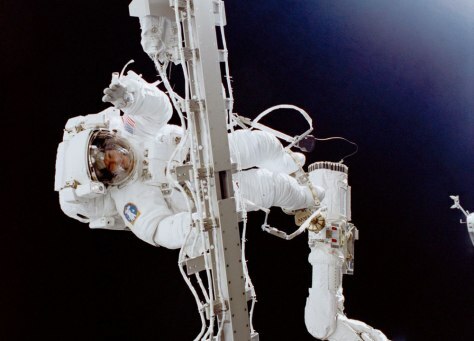 It remains the longest spacewalk in history. In August 2010, astronauts Doug Wheelock and Tracy Caldwell Dyson spent 8 hours and 3 minutes outside the space station with no shuttle present during the outpost's Expedition 24 mission, setting a different record — the longest station spacewalk without a visiting shuttle. 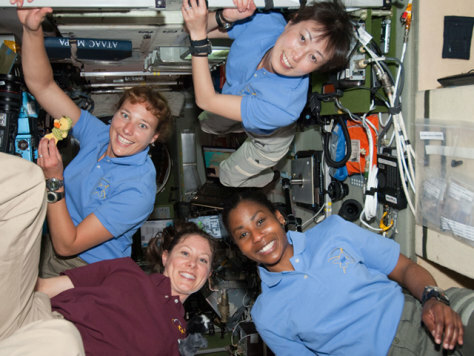 Four female astronauts — the most women ever in space at one time —aboard STS-131 in April 2010. This record stands at four women in orbit at the same time. In April 2010, NASA astronaut Tracy Caldwell Dyson traveled to the International Space Station in a Russian Soyuz spaceship. She was soon joined on the orbiting lab by NASA astronauts Stephanie Wilson and Dorothy Metcalf-Lindenburger and Japan's Naoko Yamazaki, who made the trip aboard the space shuttle Discovery on its STS-131 mission. It's a party! The largest human gathering in space was 13 people, shown here on Endeavour's STS-127 mission in 2009. It may sound unlucky, but the record for the largest human gathering in space stands at 13 — which was set during NASA's STS-127 shuttle mission aboard Endeavour in 2009. In July 2009, Endeavour docked with the International Space Station. 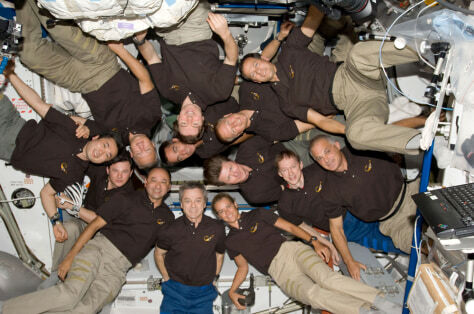 The shuttle's seven-person crew then went aboard the orbiting lab, joining the six spaceflyers already there. The 13-person party was the largest-ever gathering of people in space at the same time. While subsequent NASA shuttle and station crews matched the 13-person record, it has never been topped. Backdropped by Earth's horizon and the blackness of space, the International Space Station is featured in this photograph shot by an STS-130 crew member as space shuttle Endeavour and the station approach each other during rendezvous and docking activities on Feb. 9, 2010. Member nations began building the International Space Station — which is about as long as a football field and boasts as much living space as a five-bedroom house — back in 1998. So far, the price tag for the orbiting lab stands at about $100 billion, and NASA estimates that American taxpayers have paid about half of that amount. That makes the station the single most expensive structure ever built. And the cost will continue to rise — the station is not scheduled to be completed until 2012. The International Space Station is an orbiting lab that is the product of five space agencies representing more than 15 countries. Once again, the International Space Station is the winner. The orbiting lab is the product of five space agencies representing more than 15 countries. From one end of its backbone-like main truss to the other, it measures about 357.5 feet across. There are huge solar arrays at each end of the truss, and they have a wingspan of 239.4 feet. Astronauts live inside a series of connected, pressurized modules that are attached to the main truss. These modules have a habitable space roughly equivalent to the interior cabin of a Boeing 747 jumbo jet. The station is currently staffed by six astronauts, but that population has jumped to between nine and 13 people when a visiting vehicle — like a Russian Soyuz or fully crewed NASA shuttle — is docked. 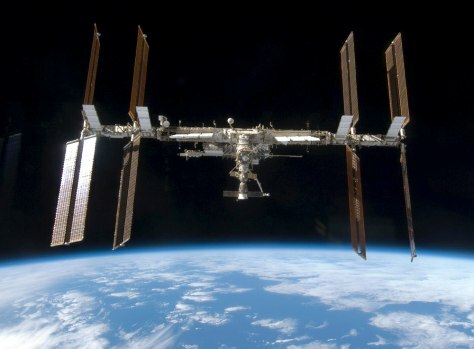 The space station is so large that it can easily be seen by the unaided eye from the ground if skywatchers have clear skies and know where to look. The station appears as a fast-moving bright light that can outshine the brightest star (Sirius) or Venus, depending on viewing conditions. You can follow Space.com senior writer Mike Wall on Twitter:@michaeldwall. 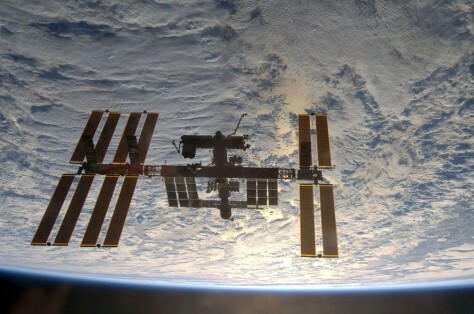 Follow Space.com for the latest in space science and exploration news on Twitter @Spacedotcom and on Facebook.